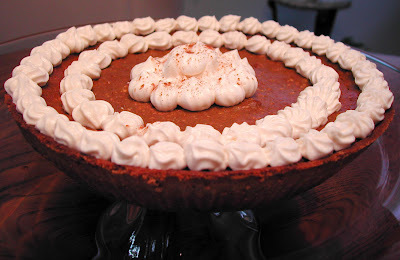 This recipe is a cross between a traditional pumpkin pie and a pumpkin cheesecake. Instead of using a cup and a half of milk, you use one 8 ounce package of cream cheese. The original recipe came from a website called myrecipes.com and it called for 2 refrigerated pie crusts. One was used for the bottom crust and the other was used to make cut-outs of leaves for decorating the top of the pie. It looked really great, but I was not in the mood to fiddle around with leave cut- outs so I opted to use pre-made graham crusts. 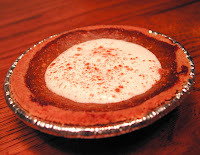 Combine 1/2 cup light brown sugar, chopped walnuts, butter, and vanilla extract; spread on the bottom of pie crust. Beat pumpkin, cream cheese, 2 eggs, molasses and remaining 3/4 cup brown sugar at medium speed with an electric mixer. Add flour, cinnamon, ginger, allspice, and nutmeg, beating until blended. Spoon pumpkin mixture over walnut mixture in pie crusts. Bake at 425° for 15 minutes. Reduce temperature to 350°, and bake 30 more* minutes or until pie is set. Remove pie to a wire rack; cool. Serve warm or chilled decorated with cool whip, if desired. *Check the mini pies with a toothpick at 20 minutes. Remove if toothpick comes out clean. What?? How did I miss this post? Anyway, it sounds really good. I love anything pumpkin. Bambola, Thanks as always for your high praise.